A specialist in emergency and critical care, Dr. Tara Hammond joined the Tufts VETS staff in 2008. Dr. Hammond earned her Bachelor's Degree in Biology from Worcester Polytechnic Institute in 1999. She attended Cummings School of Veterinary Medicine at Tufts University and was awarded her Doctorate of Veterinary Medicine in 2003. 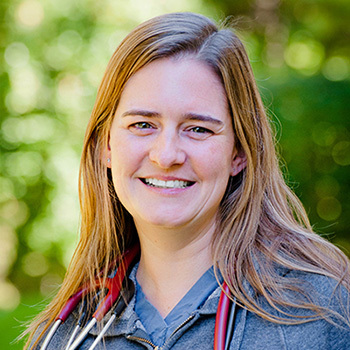 Dr. Hammond completed a rotating internship in small animal medicine and surgery at Angell Animal Medical Center in 2004 and spent time in private/emergency practice. She went on to complete a three-year emergency and critical care residency at Angell Animal Medical Center. Dr. Hammond became a Diplomate of the American College of Veterinary Emergency and Critical Care in 2008. Dr. Hammond's professional interests include limited fluid volume resuscitation, trauma, anesthesia/analgesia, toxicities, transfusion medicine, pediatrics, and coagulopathies. She is a member of many professional organizations. Her work has been published in The Journal of Veterinary Emergency and Critical Care and The Journal of the American Veterinary Medical Association.